Set on posts, these sterling silver and marcasite set earrings feature a large bow set with a single faceted garnet. 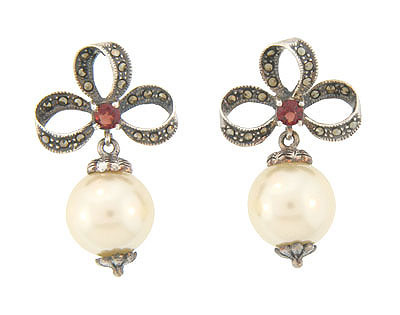 Beautiful faux pearls topped with swarovski crystals dangle from the elegant bows. These bridal earrings measure 1 1/2" long, 1" wide.